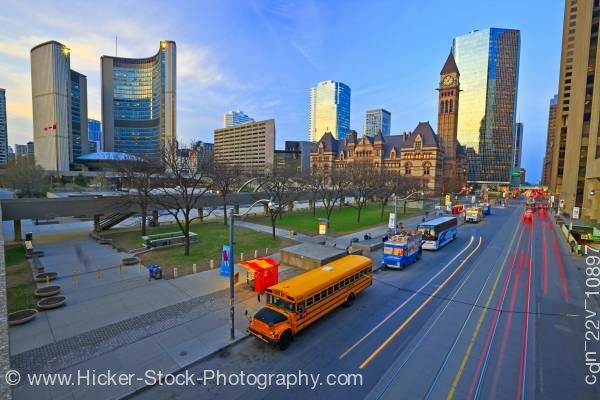 Stock photo of both the old and new City Hall Buildings and Nathan Phillips Square and street scene in downtown Toronto, Ontario, Canada. This Stock Photo shows both old and new City Hall in the background of this street scene in downtown Toronto with the Nathan Phillips Square in front of them in downtown Toronto, Ontario, Canada. The perspective on the tall buildings lit by the sun in the background is seen going along the street in front of Nathan Phillips Square, where the lower buildings and street level is seen in shadow. A bright orange school bus stands out in the center foreground, and the Old City Hall building appears partially illuminated from within.